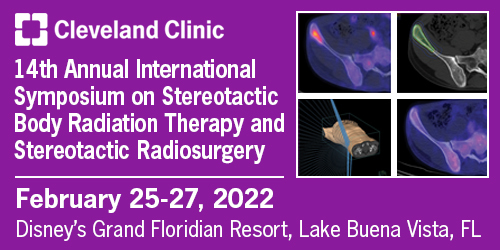 The 2019 International Symposium on Cranial and Spine Radiosurgery (SRS) and Stereotactic Body Radiation Therapy (SBRT) in Lake Buena Vista, Florida, will bring together world leaders in brain-, spine- and body-targeted stereotactic radiation modalities and techniques. Faculty and participants will have 3 days to discuss advances in the treatment of benign and malignant tumors involving multiple organ sites. A broad range of organ-specific technical and clinical experience will be presented with opportunities to interact with faculty and system vendors. Scientific abstracts will be solicited from attendees for poster presentation sessions. Radiation Oncologists, Neurosurgeons, Medical Physicists, Dosimetrists, Neuro-Oncologists, Medical Oncologists, Spine Surgeons and Neurologists.